The Cloudland Road is a great ride all by itself. This is low hill country with lots of hilltop farms. Lots of open fields with long views. To find the Cloudland Road, drive route 12 north out of Woodstock to the River Road, next to the Billing's Farm Museum, and turn right onto the River Road. Drive that until you come to the Cloudland Road on the left side. Amy: I am not sure what movie you are referring to. Tim Burton did a "horror" movie in 1999 called "Sleepy Hollow" (unless you are VERY young, I doubt that is the one <G>). Are you speaking of a film version of Washington Irving's "Legend of Sleepy Hollow?" I visited Owl's Head and Kettle Pond this year so I thought I'd add some knowledge to this thread. The gate to Owl's Head opened around 9:15ish the two days I went by. I walked up around 8:30 the one day and met another photographer who was on his way down. If you're in good shape, it's about a 30 minute hike up. It's a steady climb but not too steep, so it's manageable. However, I admit I'd be a bit spooked to do it in the dark before sunrise. The sunrise from that spot would likely be worth it though! My wife (carrying our baby daughter in a body carrier) and I attempted to hike around Kettle Pond. I wouldn't recommend it for photography other than perhaps some macro shots of leaves and such. There are good views across the pond but it's hard to get anything interesting in the foreground. This year it was also a very muddy and a much longer hike than it looks. We turned around after a third of the hike. I suspect there is a lot to explore here beyond what I've seen. I look forward to coming back. This shot was taken 10/6/09. I followed your advice, parking by the fire station and walking into the field nearby, and it was great. Thanks for posting this. I took my shots in the morning. I think it worked out okay because it was pretty cloudy and foggy. Peacham was easily my favorite village that I saw. FAX: Thanks for the information. Al Utzig mentioned that it as gated a year or so back. One thought for the "spooky" twilight walk. I bought one of those inexpensive LED headlamps. Works pretty well. I used it on the walk back down from "Little Stony Man" in the Shenandoah NP after a sunset shoot. Very Nice Take on Owls Head, BTW. Lots of color this year. What an incredible picture!! The day I was there was rainy and damp, with peeks of sun further away, but nothing compared to what you captured! Great job! These were taken around 7:30 am on a pretty cloudy morning, 10/9. On the first shot I chose a pretty warm white balance. Thought it made it look like an old postcard. Very Nice: I like the fog banks in the distant hills. Very moody. I haven't seen Peacham like that before. I love the birds that you managed to capture! It really adds to the "mood" of the photos! Those are amazing photos! Proves that you don't have to have sunshine to take an incredibly memorable photo! I thought it might be a good time for an update. 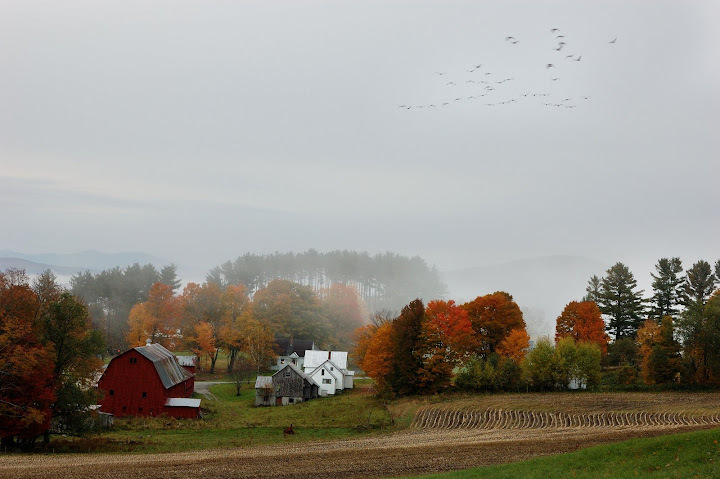 I spent the first week of October, 2010 in Vermont and about 3 days in the Waitsfield area. The first morning of my Montpelier motel stay dawned overcast and drizzly, with a forecast of more of the same. My plan had been to hit Peacham if decent weather, and if rainy, to return to the Mad River turnoff. This year, I had the barn boots in the trunk and I spent nearly 4 hours wading around the several drops, rapids and falls in this really cool area. Some of those images are on my site under the "New Additions" gallery and/or the "Vermont" gallery. It remains a very viable location. If you are a water/cascade/waterfall shooter, it is easy to find and is a really cool place. 2010 Update. 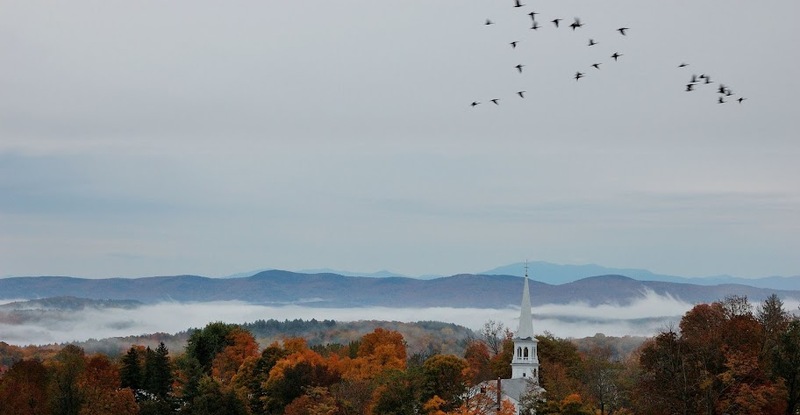 I drove from Montpelier to Brattleboro on Thursday in the first week of October. I had heard that by this time the leaves were already off in these places. It was an all morning, soaking rain, so I decided to drive this "loop" to see what, if anything, had changed. I drove to East Orange, Waits River, and East Corinth. I am (mostly) happy to report no significant changes in those areas. East Orange continues to see growth in front of the shot. There is perhaps one small area for a shot through, and this may well depend on how much foliage is present. The Waits River shot continues to be "cluttered" and any decent image you are seeing of it has had a lot of retouching done to remove power lines, poles, stop signs, gas stubs, toys in the barns, etc. But otherwise unchanged. East Corinth remains essentially unchanged and under the right light, sky and foliage conditions will remain a viable shot for the foreseeable future. I did strike up a conversation with a local resident in the little store where the roads come together in the "v". Her comments backstop what I have concluded. These 3 scenics are consistently early season shots -- get their early in the season. It doesn't seem to have anything to do with the North/South nature of them. Peacham, which is North of them, always seems to hang on longer. But to get full foliage in a Normal year, you are looking at late September to very early October for these 3. I spent an afternoon on Cloudland Road in 2010. The Sleepy Hollow (Grey Farm) Farm is still there. There is a large, new barn in the back, which is not in the "usual" photo. It is possible to shoot around the gate and at times during foliage season, it is left open. It is currently for sale, owned by the drummer for Aerosmith, and can be had for just under $4 million. I understand its a beautiful spread, with another small cabin and pond at the back of the property, up over the hill and out of view of the road. PHOTOGRAPHERS - NOTE: The Vermont DOT road closure map shows 100 closed between Waitsfield and Warren (about 12 miles south of Waterbury). On my DeLorme Map, I think that means you can get to Waitsfield from the North (Waterbury Exit on I-89), and probably to the Waitsfield Common Road, but it may mean that access to Bragg Hill Road is limited or blocked? There are many great shots on the Common Road and on Bragg Hill, (I cover them in my PDF), but if you are going to try some of them, it may be worth checking. If you are planning on trying to shoot my "Mad River" scenes, and/or Moss Glenn Falls, it may be difficult to get to those areas. There are closures additionally at Warren and Granville. The Traditional and very picturesque Village of Waitsfield is about 11 miles south of the Waterbury/Warren Interchange/Exit of I-89 (north/Waterbury goes to Stowe) on Route 100. From the intersection of Route 4 and 100 to the South, it is about 40 miles north on Route 100. 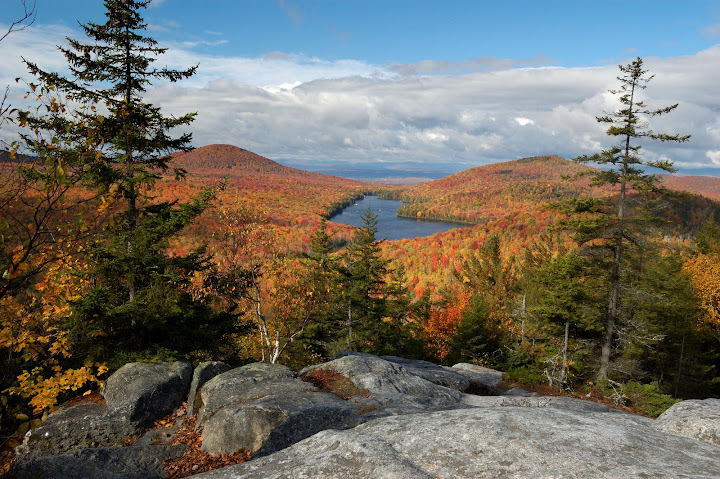 The stretch between Waitsfield and Warren is one of the most picturesque areas of Vermont. In Waitfield, there is a very nice country store on the Main Street (100). 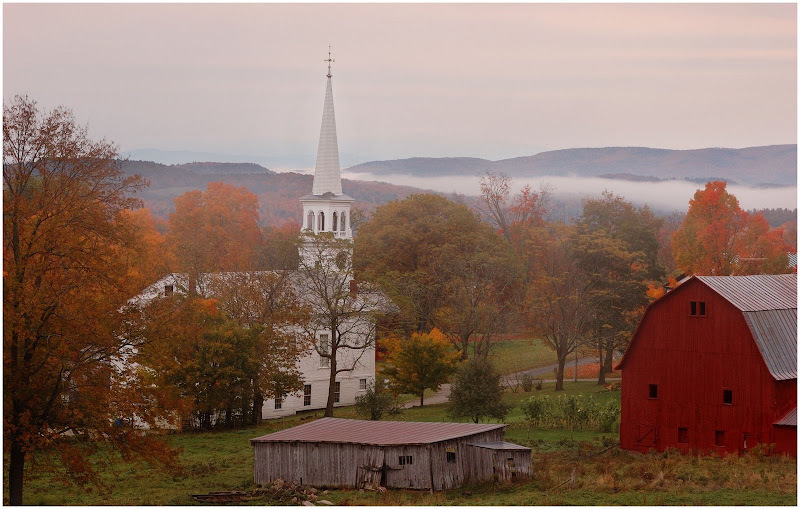 Well worth exploring is the relatively short length - Waitsfield Common Road, with long views down onto Warren Road and the distant mountains and traditional Vermont Farms and pastures, often dotted with cattle. From the North, reach the Common Road by taking Bridge Street East, to the intersection of Joslyn Hill Road and E. Warren Road. You can either continue up the hill to the Waitsfield Common (a surprisingly anti-climax triangle) and turning right (South) onto the Common Road or turn right onto E. Warren Road and follow it SouthEast to where it intersects with the Common Road, turning left (North) onto the Common Road and following it back to the Common. Just South of the Village, Bragg Hill Road begins with a very abrupt right angle turn just before the intersection with 17. It is easy to miss and it looks like you are going to turn into the parking lot of an industrial implement business. If you hit the 17 intersection, you have gone too far. Bragg Hill Road develops into some wonder full long views, as well as a couple of traditional Vermont Farm/Barn scenes. Very Much worth the drive. The road eventually loops back down onto Route 17 (which goes over the Mountain to the West toward Bristol) and can take you the short drive back to 100. Continuing South on 100 takes you to Warren. The Village is not on 100 but is on a very short, parallel loop. There are nice shops and galleries there, but there are also many road to explore with photographic opportunities. This appears to me to be among the more affluent places in VT. I know our own CTYanky routinely stays in an Inn that she has very high regard for in this area. From Warren, the very small burg of Granville is about 10 miles South. Just before you get to Granville, you will pass Moss Glenn Falls. There is a turnoff and it will likely be full of stopped vehicles. You also cannot miss the cart selling VT Maple Syrup (during the foliage season). BUT there is a stop that is WELL WORTH the photographers time between Warren and Granville. There is a small turnoff which contains a couple of picnic areas that has some wonderful views of the Mad River and some pretty dramatic waterfalls (see separate sticky post on MAD RIVER). My website (click on website at my signature) contains several shots and I have spent hours and hours photographing the water and rocks there. You can reach this region coming from the South by taking route 100 from its intersection with Route 4. The intersection is about 10 miles East of Rutland and about 5 miles NorthWest of Killington. Granville is 27 Miles. It is a very nice, scenic drive (as is nearly all of 100). Warren is 37 Miles. NOTE WELL: as this is written (just prior to the 2011 foliage season) "Tropical Storm" Irene caused severe flooding in this area of route 100 and parts of it are closed between Route 4 and Warren. See separate thread.